Root canal therapy is an effective treatment for teeth that have been deeply damaged by decay, disease, or trauma. 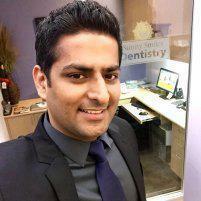 At Sunny Smiles Dentistry in Gilroy, California, Dr. Sandaldeep Singh uses state-of-the-art root canal therapy techniques to restore your damaged tooth. Dr. Singh is also skilled in pain management so you remain comfortable throughout your treatment. If you’re experiencing tooth pain or other symptoms, call the office or use his online system to schedule an appointment right away. "Definitely one of the most friendly and family oriented dental office." "Office staff is very accommodating and compassionate. I would definitely recommend!" "Dr. Singh and his wonderful staff are so kind and caring." "Dr. Singh has managed to make me feel comfortable and positive about my mouths safety. " When most of us think of teeth, we think of the hard surface layers that we see. But teeth have an interior portion called the pulp that contains the nerves, blood vessels, and other tissues that support the health of the tooth. This pulp extends from the center of the tooth down to the roots, traveling through narrow channels or canals. When this deeper portion — the root — becomes damaged by decay or trauma, a root canal treatment is performed to remove the damaged pulp and preserve the natural tooth. Once the tooth is filled, it needs to be “capped” with a crown to protect it. Dr. Singh prepares the tooth by removing a small amount of the surface material. He then takes an impression and sends it to a lab where the crown is made. A temporary crown is placed on the tooth to protect it in the meantime. Your permanent crown will be installed on the tooth at the next visit. Once the pulp is removed from your tooth, the tooth can become weak, which means it’s more likely to become broken or damaged. The crown is necessary to provide structural integrity so your tooth remains strong. Also, a tooth that has a root canal treatment can become gray or dark after the pulp is removed, so the crown helps maintain a natural appearance. Is it better to have a root canal than to have a tooth pulled? When a tooth can be “saved,” yes, it’s better to have a root canal. Having a root canal preserves your natural bite balance and avoids bone atrophy that occurs following tooth loss so you can prevent future tooth damage and even subsequent tooth loss. Most patients feel more confident when they can keep their natural teeth, and root canal treatments are usually less costly than an extraction followed by a restoration. Dr. Singh is experienced in advanced pain management techniques, including the use of local anesthetics and sedation methods so you will remain comfortable throughout your treatment. Once your root canal is complete, you can manage temporary discomfort with over-the-counter pain relievers. At Sunny Smiles Dentistry, we understand that the cost of even the most basic dental care may be prohibitive for some of our patients. However, we believe that no patient should have to forgo dental treatment because cost is a concern. We offer convenient financing vendors and payment options so that even the most advanced dentistry treatments are within the reach of each of our patients. We also make it a point to fully inform patients of the cost of treatment before we begin a procedure, so patients will never suffer "sticker shock" when they receive their bill. "So refreshing to see a service/ appointment that is working as it should be. Good service, great prices and very user friendly." "Dr. Singh and his very generous and informative staff have always made me feel comfortable no matter the situation." "I highly recommend coming here if you are looking for quality dental care in the Gilroy or Morgan Hill area. They are amazing!" "I had super experiences with Sunny Smiles. Dr. Singh and staff were very professional, quick, and considerate." "My family and I have been going to Sunny Smiles Dentistry for many years now and we are very pleased with their exceptional service and friendly staff." "Always a great experience. I really enjoy that all of the office staff and dental staff smile and really welcome you onto their practice. "